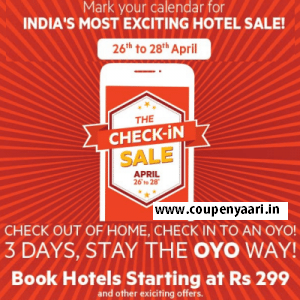 Oyo Rooms App Exciting Hotel Sale Offering Hotels booking start from Rs 299. Offer Valid from 26th – 28th April Booking on Oyo Rooms App. OyoRooms in its India’s Most Exciting Hotel Sale offering hotels bookings from Rs. 299 only.Offer valid from 26th – 28th April bookings on OyoRooms App only.